According to Haiti Press Network, Dominican President Danilo Medina said this week that he would take "drastic measures" to resolve the issue of the ban on Dominican chickens and eggs by the Haitian government. He added that there are no valid reason for the ban noting that the Pan American Health Organization (PAHO) has supported their claim that there was no bird flu in the Dominican Republic. Danilo Medina denounced the special interests behind the actions taken by Haiti and concluded that they need to find solutions to not depend on the Haitian market." I understand the frustration of the the Dominican government; however, I only have one question: What does Danilo Medina mean by "drastic measures"
Haitian's media must inform both nations about the situation, and the haitian's intelligence in DR must be active to the ultimate duty: ears, eyes, noises wide open and reporting to the haitian government promptly. The Dominican Republic Gorvernment has reacted aginst the idea that said "drastic measures", according to a member of the government, the president didn't say that he would take drastic measures against Haiti, but only drastic measures to solve the problem that the Haitian government has created when they took the decision to not to permit the entrance of birds and eggs from the Dominican Republic. 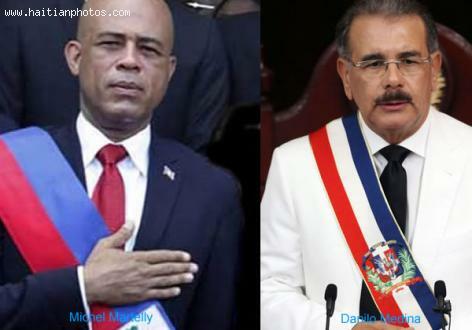 I can undestand the frustration of the Dominican Republic, because it was a sudden decision, and the president Martelly had the time to notice that rude decision to the president Danilo, because they were in a meeting the day before, a part of that, the Haitian government has recognized that there is no broblem with that issues in the Dominican Republic; so even of that recognition, they maintain their decision. Did you hear that the Dominicans are saying it is not avian flu. The Dominican Republic sells 25 million eggs and 8 million chickens a year to Haiti. Why couldn't Haiti produce meats, chickens, eggs and other goods. In an article reported in DominicanToday.Com it has been quoted that Haiti's former General Consul in DR affirmed that Dominican Republic didn't pledge money in cash for Haiti reconstruction. As a result, the Dominicans have called an ungrateful response after all they did for us during the time of grief. They also stated that they donated blood for Haitians that needed along with food and shelters. Dominicans are saying that there is not an outbreak of avian flu and as a consequence, there is no reason for imposing a ban this week on the import of Dominican meats, chicken, eggs and other goods. The only way I will believe this is to admit that in Haiti, we have no Cholera outbreak. The Haitian government needs to take this opportunity to strengthen its poultry industry. Instead of having Haitians to go to the Dominican Republic in search of work and get humiliated, they would work at home. Yes there is avian flu in the Dominican republic ant the Haitian government is within its right to ban poultry and eggs imports.